At the invitation of Patriarch Sako, Iraqi Christian religious leaders met yesterday in Erbil to discuss the future of the Mosul area. Iraq's original component, Christians are "pioneers of moderation and openness." ERBIL: Christians are an “original component of Iraq”. Despite violence and suffering at the hands of the Islamic State, they remain “pioneers of moderation and openness to welcome regardless of differences,” said Christian religious leaders who gathered in Ankawa, a Christian neighbourhood in Erbil, Iraqi Kurdistan, at the invitation of the Chaldean Patriarch Mar Louis Raphael Sako. In their final statement sent to AsiaNews, they expressed “gratitude and support” for the troops involved in the offensive against Daesh. The meeting saw the participation of Assyrian Patriarch Mar Georgis III Saliwa, Syriac Catholic Bishop of Mosul Youhanna Peter Mushi, Syriac Orthodox bishop of Mosul Mar Nicodemus Daoud Sharaf, Chaldean Archbishop of Erbil Mgr Bashar Matti Warda, Auxiliary Bishop of Baghdad Mgr Basil Yaldo, and Mgr Timathaous Qas Isha, of the Ancient Assyrian Church of the East. Among the region’s religious leaders, only the head of the Armenian Orthodox Church was absent, engaged in a pastoral visit. 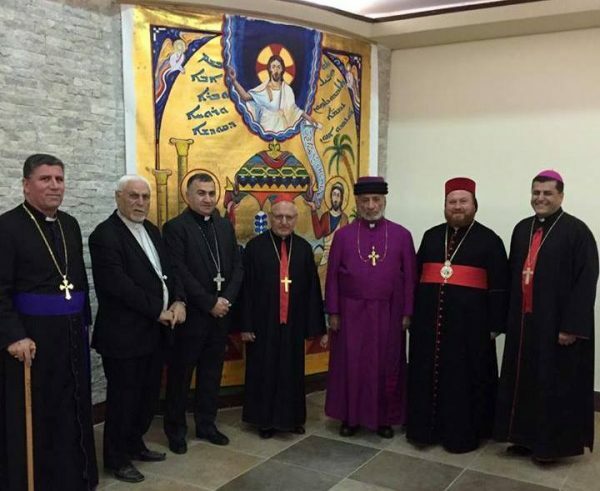 The joint statement by Iraq’s Christian leaders follows the recently-issued appeal by Patriarch Sako, who stated once more that the Nineveh Plains “are Christian”. Their words are not coincidental but are a reaction to statements by some of the region’s political leaders in favour of the area’s division, eliminating the Christian presence. For Turkish President Recep Tayyip Erdogan, “Sunni Arabs and Kurds, along with the Turkmen should remain in Mosul”. Kurds and Turks also appear to plan dividing the areas east and west of Mosul. The joint statement issued by Iraqi Christian leaders after the meeting follows. Christians are an original component of Iraq. Their churches and monasteries have continued their presence in many Iraqi towns, some of them faded in others, but they were and still are pioneers of moderation and openness to welcome regardless of differences. Christians have lived in Mosul and the towns of the Nineveh Plain for many centuries in an atmosphere of stable pluralism and cooperation with their neighbors despite some episode of violence and persecution. The atrocities that have been committed against them by Daesh and other terrorists, by way of displacement and seizing their homes and properties, has harmed and wounded them. These acts constitute crimes against humanity. 1. We stand by the demands of our suffering and anxious people about their future. Frankly, we will endeavor with all our influence to make the Christian component equal on the same level as other Iraqis, regardless of the number. Article 2 of the Iraqi Constitution “guarantees full religious rights for all individuals and the freedom of religious practice”. This should not remain only words! We expect to safeguard our rights and freedoms, and guarantee our protection with deeds, not speeches, so that we remain in our land and contribute to the revival of our country since we have the skills, potential, and competence to do so whether within the central area or the Kurdish region. 2. The displaced Christians from Mosul and the towns of the Nineveh Plain want to return to their homes on condition of safety and compensation for what they have lost and the reconstruction of what was destroyed by Daesh. They seek a peaceful continuation with their neighbors and to live together with respect, goodwill and cooperation as equal citizens. The priorities of the Iraqi State and the Government of Kurdistan should be to ensure these guarantees. 3. Regarding the administration of the Plain, Christians are looking for an acceptable formula in accordance with the provisions of the Iraqi Constitution. We as pastors feel that it is better to leave this issue to the post-liberation and the return of displaced people and their resettlement, after leaving the mines, the restoration of their houses and infrastructure. This will be discussed through a peaceful and serene dialogue with the interested parties. On this occasion, we salute our heroic fighters in the Iraqi armed forces, the Peshmerga, and the Popular Mobilization and National Units and our Christian guards who have come from all over Iraq. We express our gratitude and support to them. May Our Lord protect them to release all Iraqi territories.